You clean. You disinfect. You wash your hands obsessively. Yet somehow cold and flu season hits your house. Make this cold season easier on yourself by stocking up on supplies for the inevitable case of sniffles. 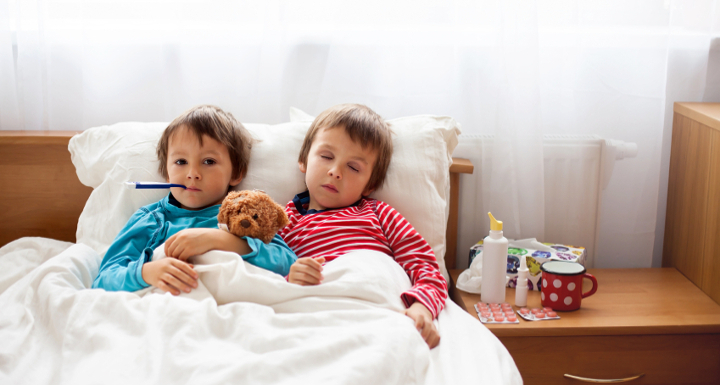 Here is a handy supply list of items to have on hand during cold and flu season. When a cold strikes nothing can beat a pot of homemade Chicken Noodle Soup it makes the house smell amazing. It tastes a million times better than canned soup and it is easy to make. Plus your kids will always remember your homemade soup. In large saucepan or Dutch oven heat oil over medium heat add onions and carrots and cook for 4 minutes stirring occasionally. Add remaining ingredients heat to a boil and then reduce heat. Cover and simmer for 10 minutes stirring occasionally until carrots, celery and pasta are tender. Remove bay leaf and serve. To freeze soup let it cool completely. Pour into a labeled Ziploc bag. Squeeze out excess air, seal and lay on a jellyroll pan (baking sheet with edges) place in the freezer for 2 -3 hours until hard. Once soup is frozen flat, remove your pan and store your soup. Linnet Husi lives in Milwaukee with her family. She makes a lot of Chicken Noodle Soup in the winter.